The Intergalactic Aerospace Expo is a celebration of flight, and as much as it is a chance for us at Origin Jumpworks to show off our own ships, getting together with others who love flying as much as we do is equally important. It is that love that’s truly at the heart of everything we do here at Origin. The thrill of an M50 roaring to life as your hand slides the throttle forward. The joy as you watch a new sunrise crest over the horizon for the first time in your 890 Jump. The quickening of your heart as the afterburner kicks on in the 85X. We understand that we’re not just building ships, but that we are crafting experiences. With our Empire-renowned design team at the helm, their passion for flight translates directly into some of the most elegant and exciting ships available today. We encourage you to come experience our distinct line of vehicles here at the Expo and join us in celebrating. The 300i and variants are currently flyable in Star Citizen Alpha 2.5. They will recieve a polish update to bring them to current standards in the future. The M50 is flyable (and raceable) today and the 85X is on track to be included with Star Citizen Alpha 2.6. The 890 JUMP is still in concept and will be built out by the artists and designers at Foundry 42. The team at ORIGIN may have the smallest lineup of the initial set of companies today… but they intend to change that with the launch of a dedicated multicrew ship for 2947. This introductory collection from Origin Jumpworks offers pilots with exacting standards and distinguished taste the opportunity to race through the Empire in comfort and luxury. Speed and elegance. Refinement and precision. Customers have come to expect only the best from Origin Jumpworks, and this select collection of ships delivers just that. Created as part of the ‘Masters of Flight’ series in conjunction with the flight-sim Arena Commander, the Renegade pays tribute to famed pilot Danny Solomon for his notable work with the Advocacy to bring justice to Bremen. This Avenger Titan comes equipped with a specialized dogfighting focused loadout and a custom special edition livery honoring this iconic ship. The sight of Solomon’s ship struck fear into the hearts of outlaws across the Bremen System. 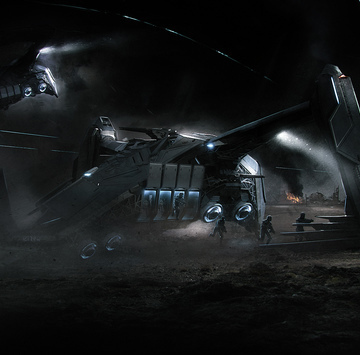 Unlike most Advocacy agents, Solomon didn’t fly the standard Avenger Stalker with holding cells in the back. Instead he piloted the Avenger Titan, which he nicknamed Renegade, then stripped out the holding cells in favor of extra cargo space. Outlaws saw this as a statement of his intention to not take any prisoners. In reality, Solomon flew the Titan because the lack of holding cells allowed him a faster cruising speed. This choice was only possible because the Advocacy worked so closely with the Bremen Defense Force, who happily transported arrested outlaws for the Advocacy. Still the name Danny Solomon became ingrained in popular culture as a hard charging Advocacy agent, famous for bringing swift justice down on those who deserved it. As announced during the anniversary livestream, a limited number of Idris-P and Javelin class capital ships will be available over the weekend. UEE War Bond editions will be available in four allotments to allow Citizens around the world an opportunity. Each allotment will include 200 Idris-P frigates and 50 Javelin destroyers. War Bond times are 3pm Pacific on Friday, 9pm Pacific on Friday, 3am Pacific on Saturday and 9am Pacific on Sunday. A final allotment which may be purchased with store credit will be available at 9am Pacific on Sunday. Straight from annals of history comes one of the most legendary ships of the First Tevarin War, beautifully and meticulously recreated by the dedicated craftsman and astroengineers at Esperia. Designated “Prowler” by the UPE Navy pilots who first encountered it in battle, this Tevarin armored personnel carrier developed a fearsome reputation for infiltrating enemy stations and ships and delivering teams of Naulle, elite Tevarin boarders, to wreak havoc on unsuspecting Humans. Now, centuries later, Esperia is making this unique ship once again available to collectors and military enthusiasts alike, preserving the feel and design of the Tevarin original while updating it to modern standards of efficiency and safety. And like all of Esperia’s ships, these are more than mere showpieces, these works of art were made to fly. There is a reason that the Prowler made its mark on history. At the time, the ship was one of the most advanced and cutting edge pieces of combat technology to grace a battlefield, and Esperia’s Prowler continues that tradition today. An ideal vessel for infiltration, boarding, troop deployment, extraction, fleet security and stealth missions, the Prowler’s distinctive hull can not only hold 16 persons, but it can rapidly deploy them thanks to its series of airshield portals. While common today, airshields were first developed by the Tevarin and changed the face of war thanks to the ease in which their troops could move in and out of the Prowler. 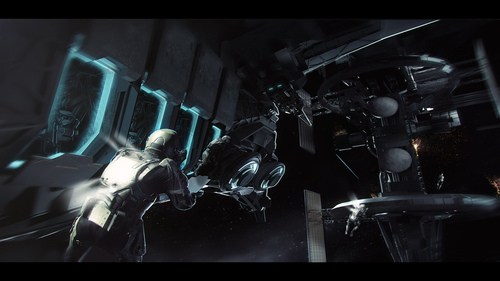 Overall, the Tevarin’s expertise in shields far outpaced Humanities own as exemplified by the Phalanx Shield that comes standard with the Prowler. A point defense shield that provides a very strong but limited protective face, the Phalanx Shield was one of the reasons that the Prowler became such a significant defensive force when flown in a squad with shields deployed and its wide variety of defensive countermeasures at the ready. In addition, the Prowler’s Grav-Lev plates give additional flight control when traversing along uneven surfaces. This comes quite in handy when trying to position the Prowler alongside a large capital ship or inside a planetary fortification. As does the remote turret positioned along the upper spine for full 360 offense. From silently infiltrating an unsuspecting enemy hangar to charging in to get forces where they’re most needed, the Esperia Prowler is a piece of history ready to make a whole bunch more. 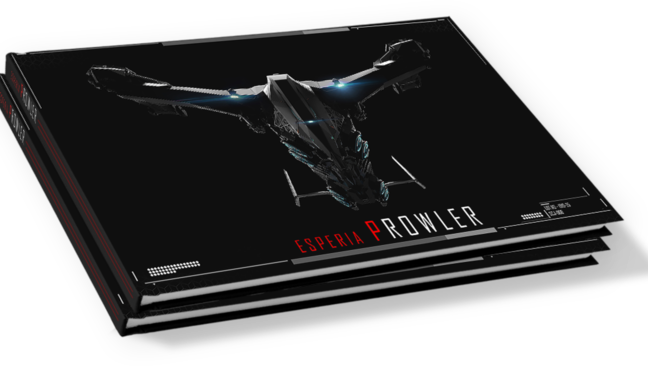 Learn more about the Prowler with this Esperia catalog. The Prowler is being offered for the first time as a limited concept sale. This means that the ship design meets our specifications, but it is not yet ready to display in your Hangar, fight in Arena Commander or fly in the Alpha. The sale includes Lifetime Insurance on the ship hull and a pair of decorative items for your Hangar. A future patch will add a Prowler poster and then once the in-game model is finished you will also be given an in-game Prowler mini ship model! In the future, the ship price will increase and the offer will not include Life Time Insurance or these extras. Additionally, please note that the Prowler will be entering the ship pipeline now, it will ultimately be released after other concept ships have been completed. All decorative ‘flare’ items will also be available to acquire in the finished game world. The goal is to make additional ships available that give players a different experience rather than a particular advantage when the persistent universe launches.